Switzerland's citizens are the happiest. And the United States clocks in at No. 15, just below Mexico and just above Brazil. Yesterday, the 2015 World Happiness Report was published. This is the third such report done since 2012 that attempts to chart people's satisfaction with their lives in over 150 countries across the globe. Gallup polls of 1,000 people per country each year between 2012 and 2014 (so, ideally 3,000 people in total per country, but some countries missed a year) asked people to rate their lives on a scale from 1-10, which is then averaged nationally. Each national "happiness bar" is made up of six factors. There's also a "Dystopia" variable that represents an imaginary country with the world’s least-happy people, so there's a base benchmark against which to measure the real countries. 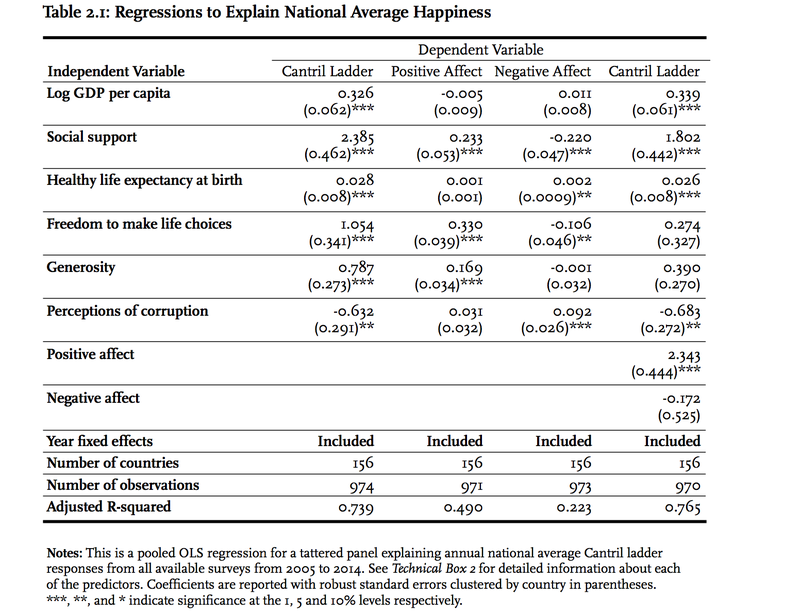 The other six factors—real GDP per capita, healthy life expectancy, having someone to count on, perceived freedom to make life choices, freedom from corruption, and generosity—are things that can be tentatively measured and multiplied by an estimated coefficient for how much that factor would influence a given person's happiness. The report, which you can read in full here [PDF], is produced by the Sustainable Development Solutions Network (SDSN) and contains analysis from leading experts in the fields of economics, neuroscience, and national statistics. In addition to ranking the countries, the report also describes how the measurement of something as subjective as happiness can and should be used as a way of assessing national progress. The goal is not just to inform but also to inspire reform. "As the science of happiness advances, we are getting to the heart of what factors define quality of life for citizens," the report's editor, Professor John F. Helliwell of the University of British Columbia and the Canadian Institute for Advanced Research, told Science Daily. "We are encouraged that more and more governments around the world are listening and responding with policies that put well-being first. Countries with strong social and institutional capital not only support greater well-being, but are more resilient to social and economic crises." 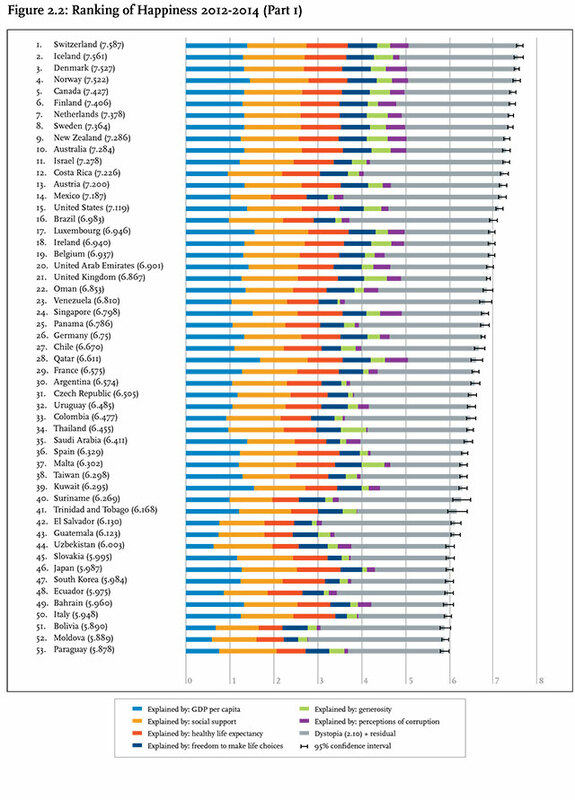 Above you can see the happiness rating for the first 53 countries. To see all 158, click through to the PDF above.